Sometimes we are so caught up in our day-to-day tasks that we forget to ask questions. We are doing tasks to check off boxes. We must move away from this ideology. Asking questions in the workplace is important for success. Once you begin to think more critically, others around you will do the same. 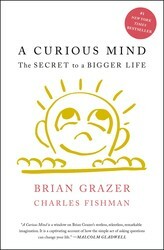 Brian Grazer, author of A CURIOUS MIND, shares why we should all be a little bit more curious. Curiosity at work a matter of style. It’s much more consequential than that. If you’re the boss, and you manage by asking questions, you’re laying the foundation for the culture of your company or your group. You’re letting people know that the boss is willing to listen. This isn’t about being “warm” or “friendly.” It’s about understanding how complicated the modern business world is, how indispensable diversity of perspective is, and how hard creative work is. Here’s why it’s hard: because often there is no right answer. Consider for a moment an example that seems really simple: the design of Google’s search page. How many ways are there to design a web page? How many ways are there to design a page for searching the web? An infinite number, of course. Two things are fascinating from the story of the design of Google’s search page. First, it’s an accident. Sergey Brin, one of Google’s two cofounders, didn’t know how to do HTML computer code when he and Larry Page first launched the search engine in 1998, so he designed the simplest possible page—because that’s all he had the skills to do. Second, people found the simple page so different from the rest of the cluttered web that they didn’t understand what to do. People routinely sat in front of the clean page waiting for the rest of it to load instead of typing in their search. Google solved that confusion by putting a tiny copyright line at the bottom of the search page (it’s not there anymore), so users would know the page had finished loading. So the story of Google’s brilliant home page is surprising mostly because it wasn’t done by design, and its brilliance took a while to become clear. Brin didn’t know how to code anything fancy, so he didn’t. And what has now become an influential example of online design usability was so baffling when it was first unveiled that people couldn’t figure out how to use it. But the home page isn’t really Google at all. Google is the vast array of computer code and algorithms that allow the company to search the web and present those results. There are millions of lines of code behind a Google search—and millions more behind Google mail, Google Chrome, Google ads. If we can envision dozens, hundreds of ways of designing a search page, imagine for a moment the ways that all that computer code could be written. It’s like imagining the ways a book can be written, like imagining the ways a story could be told on screen. For Google, it is a story, just written in zeroes and ones. That’s why asking questions at work, instead of giving orders, is so valuable. Because most modern problems—lowering someone’s cholesterol, getting passengers onto an airplane efficiently, or searching all of human knowledge—don’t have a right answer. They have all kinds of answers, many of them wonderful. To get at the possibilities, you have to find out what ideas and reactions are in other people’s minds. You have to ask them questions. How do you see this problem? What are we missing? Is there another way of tackling this? How would we solve this if we were the customer? Be sure to inspire creativity in the workplace. We have some helpful tips. Excerpted from A Curious Mind by Brain Grazer. Copyright © 2016 by Simon & Schuster. Used by permission of the publisher. All rights reserved. #1 New York Times bestselling author and Oscar–winning producer Brian Grazer has written a brilliantly entertaining and eye-opening exploration of curiosity and the life-changing effects it can have on every person’s life.From Academy Award–winning producer Brian Grazer, New York Times bestseller A Curious Mind offers a brilliant peek into the “curiosity conversations” that inspired him to create some of the world’s most iconic movies and television shows. He shows how curiosity has been the “secret” that fueled his rise as one of Hollywood’s leading producers and creative visionaries, and how all of us can channel its power to lead bigger and more rewarding lives. Grazer has spent most of his life exploring curiosity through what he terms “curiosity conversations” with some of the most interesting people in the world, including spies, royals, scientists, politicians, moguls, Nobel laureates, artists…anyone whose story might broaden his worldview. These discussions sparked the creative inspiration behind many of his movies and TV shows, including Splash, 24, A Beautiful Mind, Apollo 13, Arrested Development, 8 Mile, J. Edgar, Empire, and many others. A Curious Mind is not only a fascinating page-turner—it also offers a blueprint for how we can awaken our own curiosity and use it as a superpower in our lives. Whether you’re looking to strengthen your management style at work, uncover a new source of creativity, or become a better romantic partner, this book—and its lessons on the power of curiosity—can change your life.